Harvested mostly in Zanzibar, India and Indonesia. A small evergreen tree. Cloves begin as the aromatic flower buds of the tree then change colour to bright red when they are ready for harvesting. Used long in savoury cooking of the middle east as well as sweet dishes containing fruit such as apples, pears and rhubarb. Its mild anaesthetic properties means it is often used to relieve toothaches. Also useful to relieve nausea, vomiting and to stimulate the digestive system. It has mild antiseptic properties. 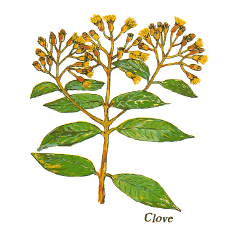 The word clove is thought to derive from the Roman word 'clavus', because of its resemblance to a small nail.Originally only grew on a few of the spice islands until later when cultivated on Zanzibar, now the world's largest producer. In the 3rd century BC a chinese leader of the Hang Dynasty insisted all who adressed him should chew cloves to freshen their breath. In the stories of 'A thousand and one nights', Sinbad the sailor bought and sold cloves.